In his eighth pictorial essay of road construction in the mid 1900s, Browning presents his most ambitious undertaking yet: New York, the Empire State. Operations of over fifty contractors, both New York based and from out of state, from the mid 1930s through the late 1960s, are shown. 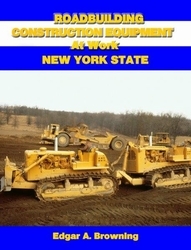 The author shows all stages of construction, and a strong representation of the tremendous variety of equipment used.